Building a replica of a historic manor house to preserve special memories. Many couples find a spot in their travels they want to memorialize in some way back home, and the owners of a distinctive Chadds Ford home were no different. Most people content themselves with a framed photo of a favorite B&B, say, or buy that book of local history to display on their coffee table where visitors just might happen to notice it. But evidently this particular couple didn’t feel those sorts of things were equal to their affection for charming Buckland Manor, an aristocratic home built centuries ago and now welcoming visitors to England’s fabled Cotswolds, among the rolling hills (the “wolds”) in the south-central region. So they built their own—as close a replica as they could—so they could enjoy its charms and their memories daily, without the inconvenience of having to cross the Atlantic. Although Southeastern Pennsylvania has a wealth of historic buildings and reproductions, European architecture is many centuries older. And so reproducing Buckland Manor posed some special challenges. The Manor’s operators say parts of the building date back to the 13th century, but generally it belongs to the transitional period when English aristocrats stopped building battle-worthy castles and started building recognizable houses better suited to gracious living. One visible feature that helps date the original structure is the liberal use of the “Tudor arch,” a flattened, often gently pointed arch that was a prominent feature in English architecture of the 15th and early 16th centuries. That feature and the modern-looking square-topped windows help distinguish the architecture from the earlier Gothic styles, with their steeper arches. 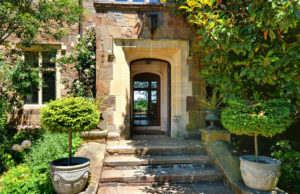 As a first step in this project, the couple persuaded the Buckland Manor management to let a local architect come in and create plans to work from to design their home. Then, to keep the replica as authentic as possible, they began looking for appropriate building materials to use. They found slate for the roofs at a local chapel, and also tried to get stone from the Cotswolds. But bringing over the distinctively colored Cotswold stone—a yellow limestone—for the walls was too difficult logistically. Fortunately, they found a similar stone back in Pennsylvania, in Avondale, and showed their masons how to cut it in a way to replicate the original stone. Extra effort went into making the historic styles be energy efficient as well as authentic looking. The large windows in the original building were a sign of wealth, but today represent wasted energy dollars. For modern dual-paned windows to look like the originals took ingenuity from the glazier and the stonemasons to achieve the dual goals. The house took three years to build, given the complexities involved, and the owners spent another three years working on the grounds to create the compatible setting. Betsy Wyeth, wife of artist Andrew Wyeth, was among the people they enlisted to help. One of her notable contributions to the property is a lovely winding driveway with a small wooden bridge and cobblestones leading to an allée bordered by sycamore trees. 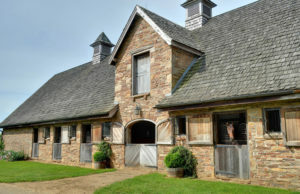 She knew the approach and design would allow visitors first see the stables that seem to emerge from the surrounding landscape, and then the house itself. Another part of the experience was making the house, as well as the surroundings, look like six centuries had passed since it was built, not just six years. The cobblestones of the allée were made to look as if they’d seen generations of use. The roof of the garage had a slight sagging curve built into it, by design. The Amish carpenters working on the project questioned that part of the design, but were assured it was what the owners wanted—to show how gravity works on a building over the generations and centuries. Perfection, so often the enemy of the good, was also in this case the enemy of the authentic. Ingenious ways to mimic the subtle signs of age are a huge part of architectural reproduction, and this project had more centuries than most to capture those effects. But it would be wrong to overemphasize the ways in which the house is different from others in our area. It’s often observed that Chester County and rural England share a certain visual DNA. And this Chadds Ford manor house exemplifies that. The house sits quite comfortably in its surroundings, despite the distance in time and space from the original. The stone and slate exteriors are certainly familiar to our area, with visual interest added by gables that extend slightly beyond the roofs. The rectangular chimneys would look familiar on either end of a classic Federal home, and the long, square-topped windows pull the design out of the medieval era and into the more delicately elegant modern styles that would follow it. The spacious house has a great hall with abundant wood- and metal-work in an English style that also resembles the Spanish styles of the period. 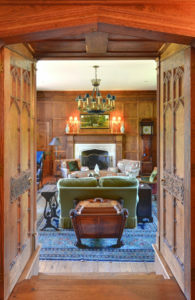 The fireplace and a wood-framed door both feature the distinctive Tudor arches. Other rooms are decorated in an eclectic variety of styles, like the original Buckland Manor. 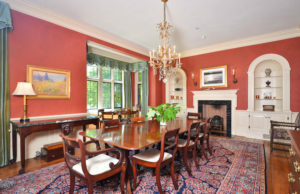 There’s a formal dining room that would harmonize with any 18th- or 19th-century home, and other rooms in the same historically elegant vein. The library, with cabinetry from ceiling to floor, houses a profusion of eye-catching details like the large globe stand and a beautifully carved wooden chest, originally meant for ice storage, that the owners found in England. And there are also more casual dining and entertaining areas with exposed timbers and stone walls. The traditional pub-styled area was deliberately painted off-white because that’s how a pub where people smoked for decades would look. Although there’s no smoking permitted today, the easygoing attitude of the more tobacco-tolerant past was meant to be part of the ambiance. The natural world was well in mind as the house was created. There’s an eye-catching whimsical square storage shed next to the potager—a garden to supply fresh vegetables and herbs to the kitchen. 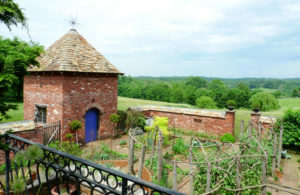 The late Rosemary Verey, a famed English horticulturalist, designed the potager and other gardens that surround the house. Tending them has become a passion for the owners. 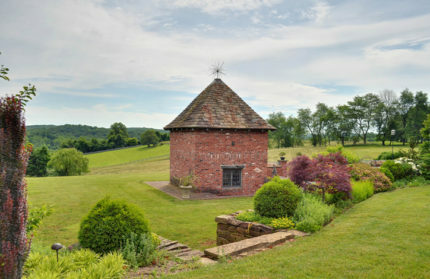 The 240-acre grounds, all under conservation easement, include a number of outbuildings, among them stables that the owners, who once drove horses on their six miles of trails, now rent out. Since moving in 22 years ago, the owners have keenly appreciated life on their own historic property. British troops crossed the land in 1777, heading for battle along the Brandywine, and the views the owners look out at are much the same today. In all that time, the couple have lived in a recreated piece of the Old World, built in what Europeans once called a New World. And they’ve enjoyed, literally, the best of both.